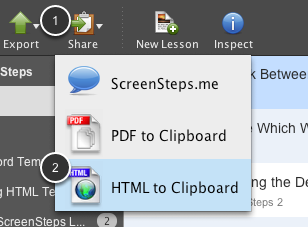 With ScreenSteps you can quickly copy any lesson to the system clipboard in HTML format. You can then paste the lesson into an email program like Outlook or Apple Mail and send the lesson to someone. If you have a lesson open or you have a lesson selected in the lesson library list you can click on the Share icon in the toolbar (1). Select HTML to Clipboard in the menu that appears (2). The lesson will be exported using the assigned Clipboard HTML template and the resulting data will be placed on the system clipboard in HTML format. 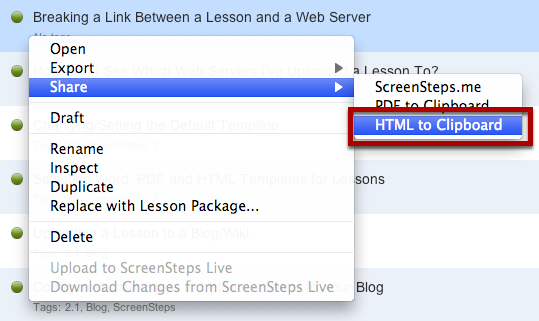 You can also right-click on a lesson in any list and select the Share > HTML to Clipboard option.